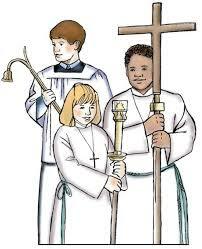 Role: Altar Servers play a useful role in our liturgies. The Priest relies on the Altar Server to aid him during Mass or other liturgical celebrations. Formation: Initial and ongoing formation provided. Personal Qualities Needed: This an important and helpful ministry available to boys and girls in the fourth grade or older who demonstrate a willingness to serve. Adults may also serve in this important role. Time Commitment: Attendance at initial and ongoing formation as well as scheduled Masses.